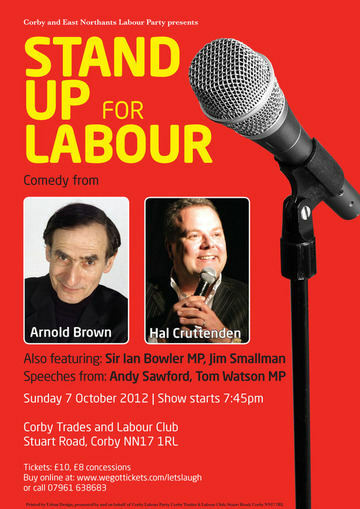 Stand up for Labour is making the final preparations for the Corby event, which takes place at the Corby Trades and Labour Club, Stuart Road, Corby NN17 1RL on Sunday 7 October. Pioneer of the alternative comedy movement ('and why not?') Arnold Brown will be opening the show, which starts at 7:45pm. Arnold is a former Perrier Award winner and can even claim to have shared the bill with Frank Sinatra! Following Arnold will be Sir Ian Bowler MP (a character act who plays a Conservative politician) and Jim Smallman, a Labour activist from Leicester who regularly plays the major comedy clubs across the country. Headlining the gig is Hal Cruttenden, who has appeared at the Royal Variety Performance and was a recent star of Michael Macintyre's Comedy Roadshow. The two speakers for the night are the Murdochs chief cross-examiner Tom Watson MP and the Labour candidate in the Corby and East Northants by-election Andy Sawford. The event will see the debut of the Stand up for Labour banner, which will be used as a backdrop for all shows as well as doubling up as a banner for demonstrations. There will be prizes given out on the night. Don't miss out! Tickets are available at £10 or £8 concessions. Disabled carers have free admission. To buy a ticket online go to www.wegottickets.com/letslaugh or call 07961 638683.